I have been planning to try this recipe for such a long time.Overdose of Apples at home made me decide that I could not postpone this further.So sacrificing my half an hour nap I put on my apron and started sifting and measuring and creaming,taking pictures as it progressed.The batter was fragrant and thick and dreamy,almost custard like.I mixed in the chopped apples and topped the cake with crumb mix. Oh the crumb mix.I could write an entire post on it.I am planning to make another batch just so that I'd be ready to bake with it any time I feel like. Ah,so I preheated the oven,put in the cake tin and went about my usual chores.Somewhere in between,I was drawn to the kitchen by the wonderful aroma of apples and cinnamon and I peeped in to see the cake browning well and rising beautifully.Since I could not wait to eat it,I checked the time and there was still some 22 minutes to go. Whoosh,I heard the generator sound and fingers crossed,I went to check on the oven and as expected,the power was off.I almost cried and then started hoping the power would be back soon and I'll bake the cake.Time started ticking and it was soon 2 hours gone.We had to go out for some work,so the unbaked cake sat in the oven for another 3 hours. I checked the cake as soon as I came back(power was back too) and it had sunk in the middle.I baked it again and surprisingly,it rose well and the wonderful aroma was back again.Though it cooked well,it was somewhat sticky.I gave it a night's rest and cut it the next morning.The texture was a bit sticky,moist and crumbly,but the taste-oh the taste,was awesome. 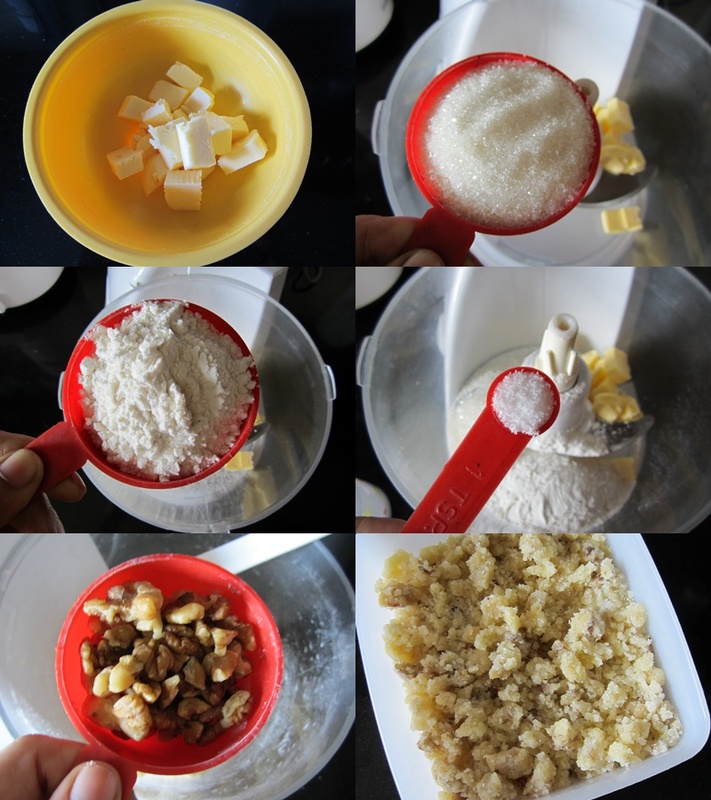 Mix together all the ingredients for the crumb topping,except the walnuts.Use a pastry blender or a fork or pulse it in a food processor.Mix in the chopped nuts.Refrigerate till needed. Preheat the oven to 180C.Grease and line the bottom and sides of an 8' round or a square pan. 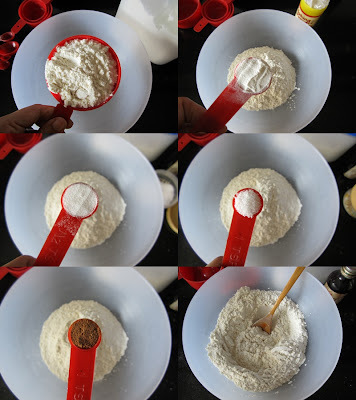 Sift together flour,baking powder,baking soda,salt and cinnamon powder.Reserve. Beat the butter and sugar on medium speed until light,about 3 minutes.Mix in the eggs one by one beating for about 1 minute after each addition,followed by vanilla. Add the flour and yogurt alternately beginning and ending with flour.Beat till you get a smooth batter-batter will be thick. 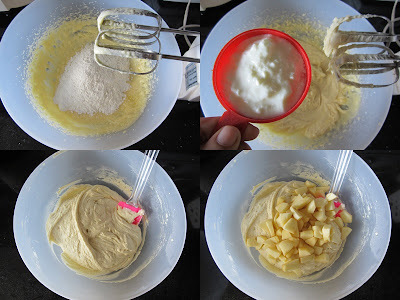 Mix in the diced apples. Transfer the batter into the prepared pan and even out the top using a spatula. Sprinkle over the crumb topping evenly. Bake for 50-60 minutes or till the crumbs are golden and a toothpick inserted into the cake comes out clean. Serve plain or with some whipped cream or custard on the side. Original recipe is made with Blueberry,Dorie suggests this can be made with other berries too(except strawberry,since it will become watery)as well as with peaches,apricot,nectarines or plums.I am thinking Pear with Ginger would work too! The crumb topping can be made ahead in time and can be refrigerated up to 3 days. The cake tastes great on its own,but I am thinking some creamy vanilla custard would be a perfect pairing for this. The cake looks yummy inspite all the confusions in between :) I've baked this cake from her book long time ago but it never appeared on the blog :) Have to bake this one again! We love it! Thanks to ur mention about Staines trading Co in Kochi.... Finally I tracked it down but was in a rush to buy anything... I have a huge list of baking stuff I wanna buy... Thanks a ton! The cake looks so comforting! And I love the coconut groove in the background in the pictures. interesting recipe...i never tried crumb topping in cake but it looks yum I'll def give it a try:) but a few queries raising in my mind- 1) can i use mashed Banana along with diced Apple in the cake batter?2)i don't like cinnamon, can i omit it from the recipe? is it make any difference in the taste? 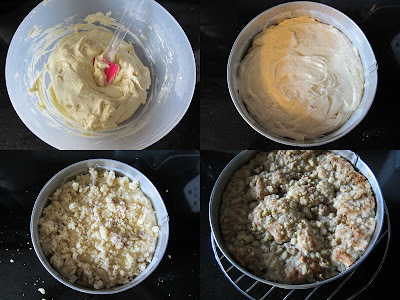 You should try the crumb topping,it elevates the cake to another level.I am not sure how Banana would taste with Apples,sorry!The pairing of Cinnamon and Apples is excellent,however if you don't like Cinnamon,use more Vanilla instead,it will turn out just fine! awesome!.........lovely cake and what a forgiving recipe!.the cake looks great even after the torture of a power cut! But it looks like inspite of all that your efforts were fruitful! Wow what a lovely cake. It is difficult to believe it sank. I want try this one. 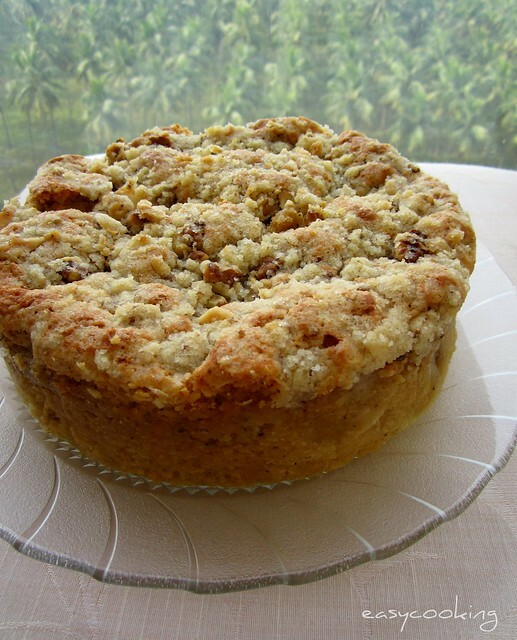 Lovely recipe and stepwise..crumb cake looks super tempting. Th cake looks so yum. Your r best in preparing cakes. Divya, Apples in a cake can never go wrong. Between love the coconut grove in the background. Neat view. 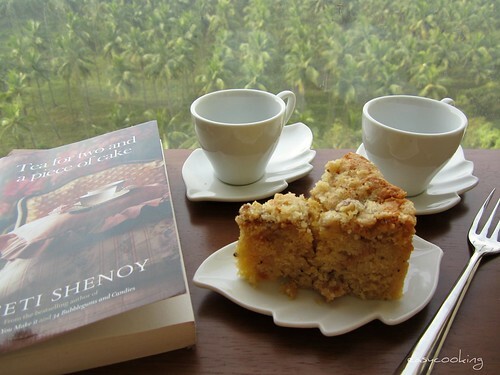 The cake turned out fabulous in spite of all mishaps..loved the crumb topping n thats a lovely background..is that the view from ur new house?? Thanks Prathibha,yes that's the view from our balcony! 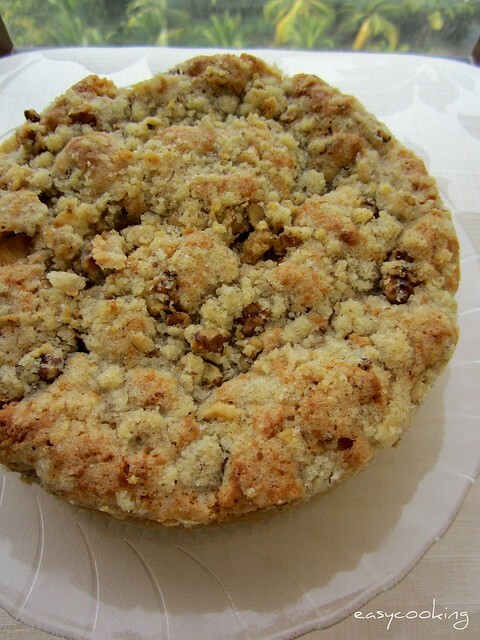 Apple crumb cake is awesome divya. The texture has turned out perfect. Pics are pleasing. 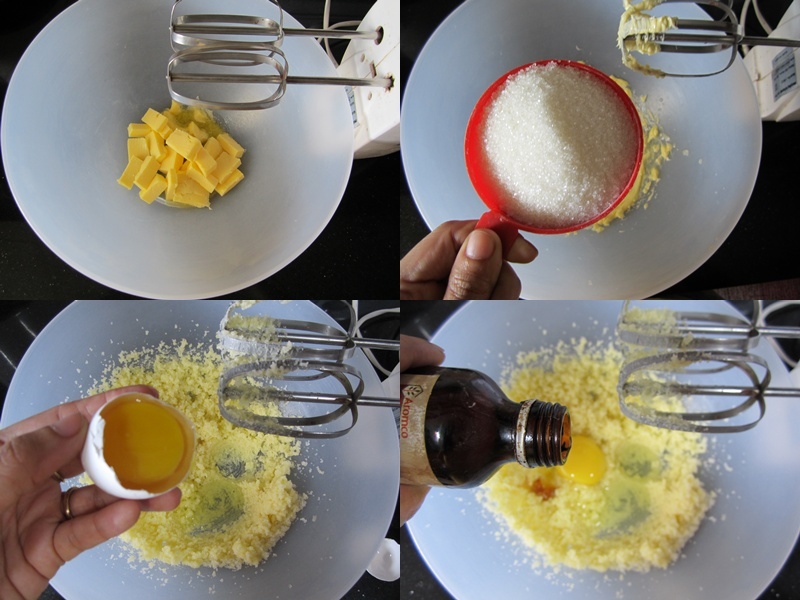 Can I substitute the eggs with milkmaid/condensed milk? Also, I read that you use your microwave oven (in convection mode) for your baking. I try to do the same too, but my cakes burn very very fast (say with 6 mins at 180C preheated oven), i.e. the crust burns while the cake remains raw inside. Does the grill always come on in convection mode? Mine does and (IMO) hence the charring. Btw, I tried some of your cookie recipes and the results were yummy!! Thanks for all the yummy recipes! Wow - so pretty! One dollop of rich french vanilla on top and this is ultimate good food! I just love your blog..And tried so many recipes and all came out awesome in taste.!! Just wanted to know the temperature used to bake this cake. I am planning to bake it in my IFB convection microwave. This turned out to be a great hit with my hubby who has been so religious in helping me follow my passion of baking. Have taken to baking 2 months back and you have been my guide all through. One issue that bothers me is the cake usually gets done well but the texture doesn't seem to be spongy like in your blogs. I'm really shattered and get bogged down easily:( Can you please help me here?? Hihi I chanced upon ur blog n was really inspired! ! I jus made this and my kitchen smelled marvellous! ! I cut down the sugar slightly and im really loving how well it turned out!! Thank u for sharing! ! Can I check if I need to refrigerate the cake and how long does it keep for? I'm glad to know you liked the cake.The cake keeps well at room temperature for a day or two.However,if refrigerated it lasts long.Just put the slices in an airtight container and warm a bit before serving.